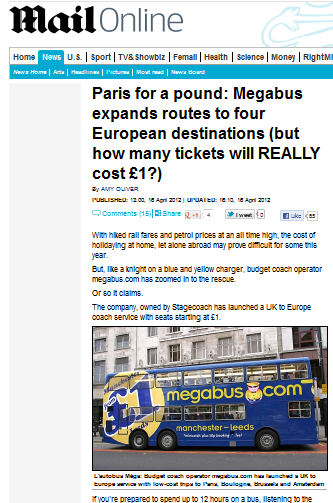 Following the launch this week of the Stagecoach megabus.com routes to mainland Europe, Amy Oliver, reporting for the Daily Mail, produced an article that supposedly looked at the new services, with particular regard to whether any £1 fares were available. like this one heading for Aberdeen. This is a typical piece of negative tabloid journalism, not helped by the inclusion of a picture of one of the original vehicles used to launch the UK services 8 or 9 years ago. Maybe a picture of a brand new coach bought specially for the new services, wouldn't have fitted the negative image that this particular so-called journalist set out to create. The expectation that one can just get a £1 ticket at any time is obviously somewhat misguided and anyone thinking that needs to join the real world. During 2005 I made a trip to Derbyshire from Newcastle and by booking ahead obtained a £1 ticket (+ 50p booking fee) that got me as far as Sheffield. The remainder of my trip by tram and local buses cost me much more than my 140 mile £1 trip by megabus and I was therefore quite pleased with the megabus.com offer. Since those early days the vehicles now used are relatively new coaches, most of them being bought specially for the job, but thinking back to my 2005 trip the coach seated ex Hong Kong double deck bus that I travelled on wasn't too uncomfortable either. The opportunity nowadays to travel to Paris for £4 on a brand new coach, including the ferry crossing and free on-board wi-fi, would be regarded by many students, retired people and others as an absolute bargain. Don't knock it Amy, get from behind your desk and try it like a real travel journalist would do and that way you could get some pictures of the brand new Van Hool vehicles. If you do, I promise that we will publish your picture of one of the new coaches on this website! In the meantime if anyone else can oblige by sending us a picture we would be very grateful, as I think it might be a while before Amy ventures down to Victoria Coach Station.